Something I noticed about a decade back --it started as a piece of wancy observational comedy just bouncing around in my head, but has since become EERIE out of all proportion. Now, because I'm kinda disorganised, and also duty-bound to drive me mam to her last-minute shopping, I invariably spend Christmas Eve in, say, The Galleries Bristol, Brunel in Swindon, Yate Tesco (by all accounts the biggest in the country), always when they're crazily busy. 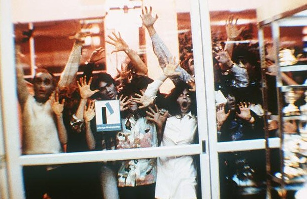 And I don't mean 'busy' as in, 'ah, those loveable, scampy humans and their consumer culture', I mean --just picture the Dawn of the Dead zombies-and-bikers shopping mall sequence, only suddenly a lot more zombies are feckless housewives and bourgeois men. You think, 'Aren't I lucky / unlucky to have found the _one_ parking bay that's left out of a gazillion spaces'. As far as the eye can see, the whole place is like a 'Where's Wally' poster of people tottering around picking out _just the right_ ratio of chocolate and mini-cheddars and gravy and cheese and crapping paper and Mary Berry cook books, as if the whole thing is a deadly puzzle designed by Jigsaw. You turn to your left, there's a lurching house-husband an inch from your face. You turn to your right, there's a little student type who thinks she's some kind of zany, Catlin Moran-style domestic goddess prototype but is actually just scurrying greed incarnate. To the south, a swarm of old men who retired age 55 in 1982 and have stayed 55 ever since. To the north, some scarf-wearing male models and their ten kids. The place is a nightmare, densely populated --to the point where you can't imagine being on your own ever again. The crowd has you in kind of a mass-queue where everyone's waiting for such inexplicable domestic tat. The next time you see auld Schwarzenegger in 'Jingle all the Way', you just know it's going to trigger some 'Our Brave Boys'-style PTSD. So answer me this: outside the toilets: a horrific swarm of bodies. Inside the toilets: empty. Explain. The first time I noticed it, about a decade ago, I just thought, 'funny'. Y'know, just 'Funny'. Funny. Then it happened again the next year. And every subsequent year. No matter how insanely busy the shop is, there's never ANYONE in the khazis. How does that work? Does the high-pressure of buying Christmas shig cancel out their natural biological need to wee? And it's weird to feel such joyous isolation in a toilet. Today I just wondered, why do our business leaders and the media claim that 'we're having a bad season' in terms of trade? Everywhere is just a huge, milling crowd. It's plain to see, every company's Purchase Manager (or should that be Purchase _Middle-Middle-Middle_ Manager) is just buying too much stuff no one wants to buy. The stuff people _are_ buying is flying off the shelves. The same is true of the Royal Mail. When was the last time you saw a Post Office at the weekend that isn't stuffed? And they _literally_ have commercial inputs on every street corner. How can they go wrong? I'll tell you: stoopid corporate projects, inefficiency, an adherence to trendy, inexplicable fashions. So yeah. It's only Christmas good will that's stopping me clicking my Thanos fingers multiple times as if to a Hall and Oates track. Previous entry Who's up for some Queen's Speech Bingo?